Entertaining Mr Sloane - 50th Anniversary Celebration! In summer 2014. 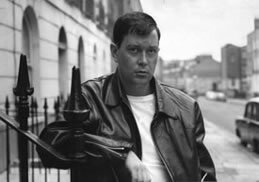 Leicester University, which holds the Joe Orton Archive, hosted a day of screenings, talks and readings to celebrate the 50th anniversary of his first play, Entertaining Mr Sloane. Extract from the BBC Sound Archives where you can hear Joe speaking to Roland Orton about his childhood and early career, his time in prison and his views on Shakespeare. Wonderful extract from a 1982 BBC Arena documentary about Joe, shown in September 2007 as part of BBC 4's Hidden Lives season. Features a section about the defaced Islington library books. Comprehensive site dedicated to the late Leonard Rossiter, including this wonderful descripton of his last performances in Loot, reviews of the performance and interviews with cast and director. Writer, director and playwright Charles Marowitz describes his experiences working with Joe on the first London production of Loot in 1966. Actor Dudley Sutton dedicates this hymn to the vanishing world of Gents' Lavatories to Joe. Dudley Sutton played Sloane in the 1964 production of Entertaining Mr Sloane. THE LOOK’s blog: all about the combustion which occurs when great music meets fantastic fashion, design and style. Here THE LOOK investigates Prick Up Your Ears, a 1978 Orton-inspired design from Malcolm McLaren and Vivienne Westwood.